The school for social capital? The New American Academy, serving poor non-white youth in Crown Heights, Brooklyn aims to reinvent education, but it may well be a strong contender for building social capital as well. “The New American Academy [NAA] is an innovative, potentially very powerful way to provide education to children. It is both brilliant and scalable and holds out the hope of changing K-12 education in major ways. 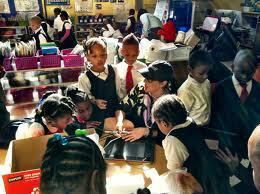 Educationally, NAA started in 2010 as a public school with kindergarten and first graders. Each year they will add another grade until they reach fifth grade. They assign 4 teachers to 60 students who they remain with from grades K-5. The teachers are compensated and promoted based on performance their 60-student flock as well as on peer and supervisory review. OneMaster teacher (paid $120,000 annually) helps supervise the overall direction among 3 less senior teachers who rotate among 3-4 tables. The school was founded by a Shimon Waronker, “who grew up speaking Spanish in South America, became a U.S. Army intelligence officer, became an increasingly observant Jew, studied at yeshiva, joined the Chabad-Lubavitch movement, became a public schoolteacher and then studied at the New York City Leadership Academy, which Mayor Michael Bloomberg and the former New York Schools chancellor, Joel Klein, founded to train promising school principal candidates.” While a doctoral student in Harvard’s Urban Superintendents Program, he conceived the NAA educational approach based on the elite Phillips Exeter Academy and in 2009 won Harvardʼs Phi Delta Kappa Award for Innovation in Education. Waronker, a Hasidic Jew, who sports a long bears and wears a black suit, black hat and a velvet kippa, seems an improbable leader for a non-white inner city school. But he gained credibility after reviving the failing extremely violent Jordan Mott School in the depressed South Bronx and overcoming parental wariness ultimately to gain the trust of parents and students. In principle, the school seems unusually well-designed to promote social capital building among the students and teachers. There is a high mix of teamwork, the students get a lot of practice in honing civic skills (like making presentations) and sit around larger tables participating in teacher-led group discussions. The school is important for at least two reasons. Much social capital research and socialization research demonstrates that “as the twig is bent, so grows the tree”. These early years are a critical time to teach the soft non-cognitive skills that are increasingly valuable in today’s society like teamwork, building relationships, negotiating differences, etc. So this early experience in building social capital, if successful, could be an important model. Second, we are increasingly discovering in our own research that working class kids (white and non-white) are increasingly falling through society’s cracks and are falling further and further behind their counterparts from more affluent and educated backgrounds. While it is still to be proven, NAA seems to offer promise for what schools could do to start to close these gaps among kids who happened to be born on the wrong side of the tracks. I look forward to the research that compares the educational and social outcomes of kids attending NAA against their matched counterparts who don’t. 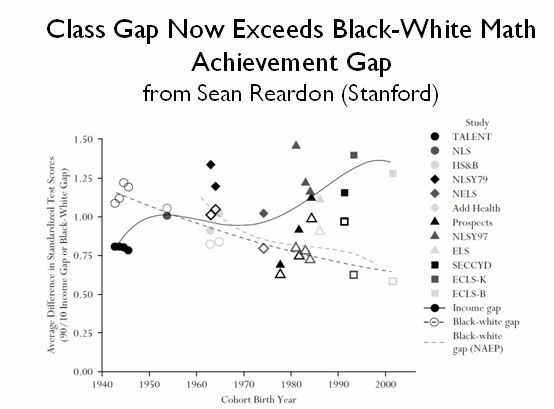 White class gap in math test scores as great now as black-white gap in the racial backwater prior to Brown vs. Board of Ed. The New York Times had a powerful and alarming story today “Education Gap Grows Between Rich and Poor, Studies Show“. The second graph solid line shows whites and non-whites together but the dotted line on the second chart (the black-white racial gap) has been almost halved over the last 60 years from about 1.2, dropping to around 0.65 by 2000 (about the difference between a 5th grader and a 7th grader). So even if you take race completely out of the equation, the class gap in math (and reading scores) within whites is almost DOUBLE the racial gap along these same measures and upper class whites are about 2 grade levels ahead compared to the black-white gap. And the within white class gap in math test scores is about as great as the black-white test score gap in math was in the racial backwater leading up to Brown vs. Board of Education when the Supreme Court recognized that racially separate schools were inherently unequal. The conclusion is that our focus on racial inequality in education has been important in halving these differences, but in an era of deindustrialization of America and the decline of good-paying high-school education jobs, we need to be paying as great attention to class gaps in math and English achievement if we hope to have vibrant social mobility in the decades ahead for the white working and lower middle class. See somewhat related strong Op-Ed by Nick Kristof “The White Underclass” (2/9/12) (acknowledging some of the social truth of the cultural and family collapse of the white working class as Charles Murray’s Coming Apart does, while also identifying the much larger structural changes taking place as well which Murray does not). 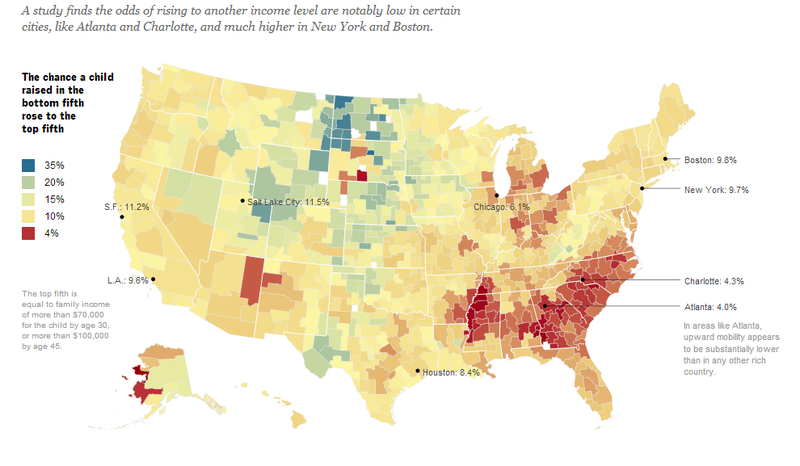 See earlier blog post on social mobility in America. 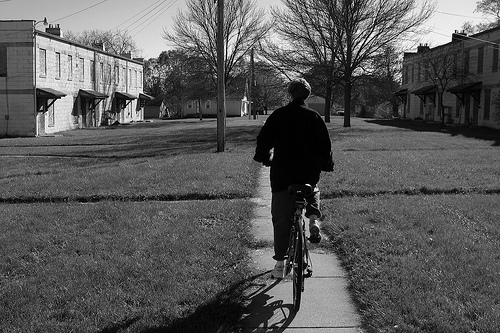 A new report by Kendra Bischoff and Sean Reardon for the Russell Sage Foundation and Brown University found that, as a likely consequence of widening American income inequality, fewer and fewer Americans live in urban middle-class neighborhoods and urban communities are instead increasingly polarized into rich and poor neighborhoods. They call this increased “income segregation” or “family income segregation.” Their report studies 117 metropolitan areas with a population of 500,000 or more in 2007 and examines these patterns at the census tract level, covering roughly two thirds of the US population. This is bad news for the opportunity to build bridging social capital (social ties across race or social class), bad for building any sense that we’re all in this together, and by insulating the rich increasingly from the poor, makes it less likely that the rich will want to take action to help the poor (in the same way as the rich become less interested in public education investment if they send their kids to private schools or become less interested in safe streets if they live in a gated community with a private police force). 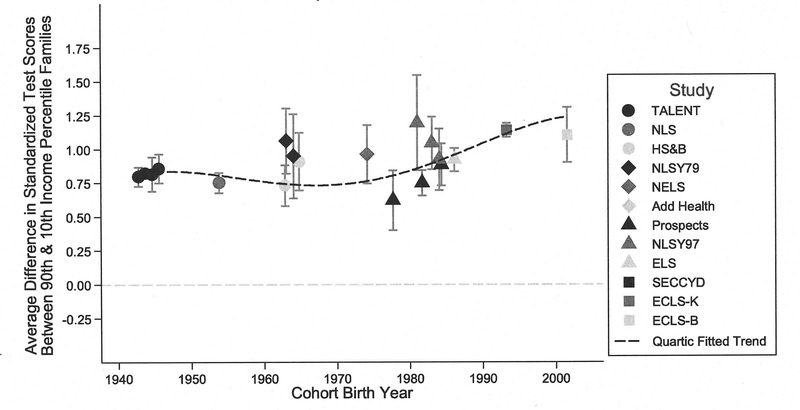 This research shows how children are less likely to grow up socializing with and playing with children of other socio-economic backgrounds, especially in an era where mandatory school-busing has come under attack. These trends are all prior to the 2008 great recession, so it is impossible until 2013 to know whether that exacerbated these patterns or ameliorated them somewhat, and even then we probably won’t know about specific neighborhoods. Bischoff points out that these segregation indices would change during the recession only if foreclosures or job losses force people to move, then income segregation could change. For instance, if low- and moderate- income families need to move to lower-income neighborhoods, urban residential segregation would increase (more clustering). Alternatively, if middle income families lose income, but remain in their homes (or neighborhoods), then residential income segregation would decrease as neighborhoods as increased family income volatility leads neighborhoods to become more diverse in income terms. The American Community Survey may never be able to resolve what happened at low levels of geography. ffected by the character of the local areas in which they live. The increasing concentration of income and wealth (and therefore of resources such as schools, parks, and public services) in a small number of neighborhoods results in greater disadvantages for the remaining neighborhoods where low- and middle-income families live. The affluent are more segregated from other Americans than the poor are. That is, high-income families are much less likely to live in neighborhoods with middle- and low-income families than low-income families are to live in neighborhoods with middle- and high-income families. This has been true for the last 40 years. Income segregation among black and Hispanic families increased much more than did income segregation among white families from 1970 to 2007. Notably, income segregation among black and Hispanic families grew very sharply from 2000 to 2007. Income segregation among black and Hispanic families is now much higher than among white families. Read “Growth in the Residential Segregation of Families by Income, 1970-2009” (Sean Reardon, Kendra Bischoff). See NY Times story, “Middle-Class Areas Shrink as Income Gap Grows, New Report Finds” (11/16/11, by Sabrina Tavernise) which also shows this pattern for Philadelphia, which showed the biggest increase in income segregation over this period as well as the overall decline in middle-class neighborhoods and the rise of poor neighborhoods. See somewhat related post by Liberty Street Economics (the blog of the Federal Reserve Bank of New York) that shows both that median wages were growing fastest in the high-skilled occupations, and also that job growth was fastest in both the high-skilled and low-skilled occupations and slowest in middle-class job occupation. Woessman is on the faculty of Economics, University of Munich and Head of the Department of Human Capital and Innovation, Ifo Institute for Economic Research. If interested in attending, e-mail Antonio at pepgadmin@hks.harvard.edu. Abstract: Does the Internet undermine social capital or facilitate inter-personal and civic engagement in the real world? Merging unique telecommunication data with geo-coded German individual-level data, we investigate how broadband Internet affects several dimensions of social capital. One identification strategy uses panel information to estimate value-added models. A second exploits a quasi-experiment in East Germany created by a mistaken technology choice of the state-owned telecommunication provider in the 1990s that still hinders broadband Internet access for many households. 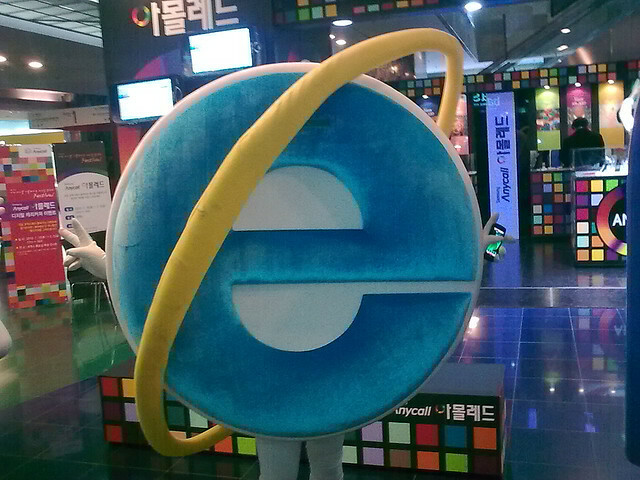 We find no evidence that the Internet reduces social capital. For some measures including children’s social activities, we even find significant positive effects. We’ve reported earlier on the UK government’s recent decision to measure the happiness of its citizens. The latest government to do so is neighboring Somerville, MA. Somerville, which went by the nickname of “Slummerville” in the 1980s for cheap and affordable 3-decker housing and the highest residential concentration of any community in New England, has recently become more hip and gentrified thanks to the revitalization of places like Inman Square and Davis Square. The city is collaborating with happiness expert Dan Gilbert at Harvard and ultimately hopes to use these data to see how things like the extension of the subway green line affect happiness or how Somerville’s happiness compares with neighboring towns. The survey also asks residents to rate Somerville’s “beauty or physical setting” [likely fairly low for anyone who has spent time in Somerville], “availability of affordable housing”, quality of local public schools, and effectiveness of local police. Researchers hope to correlate ratings of well-being, demographics, satisfaction with Somerville amenities, and proximity to various parts of Somerville to unpack what makes residents more or less satisfied.